Hidden Hanger | H.Prall & Co. This week I want to chat about how to display a wreath or decorative door hanger. Now, I know there are some pretty wreath hangers available, but sometimes…they can feel a little like something my mom would use...not necessarily hip and cool. While I have used them (and actually just used 2 cute pineapple ones at the Airbnb I styled a couple months ago—you can check that out here + here), I prefer to use a Command Brand hook (shop for those here) for displaying on doors. 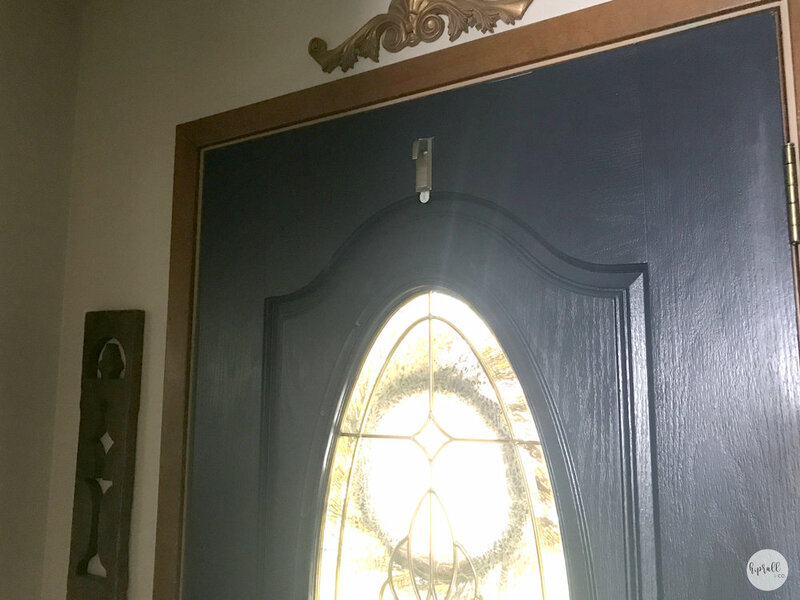 I’m sure a lot of you have used Command Brand hooks for a lot of things and probably have even used them to hang a wreath on your doors (I’ve been in a lot of houses and have seen a lot of Command products being used—no one likes nail holes!). I mount the hooks a little differently, though, because I don’t like to see them on the front of the door. To keep the hook out of sight, I attach it to the back of the door, upside down. I’m then able to use fishing line (clear and almost unnoticeable) to hang the wreath over the front of the door. The line catches on the underside of the hook and then drapes over the door. This is an easy way to hang almost anything…even a piece without a ready-made hanger; the fishing line is easy to attach and then loop onto the hook! Using the Command Brand hooks this way + the fishing line creates a clean look for any door display! I have matching wreaths on my 2 outside doors that I wanted to seem like they’re almost floating. I love the yellow against the teal door (Gypsy Caravan by Clark + Kensington)! You can buy these same wreaths here! I’ve used this method a couple of times lately in my clients’ homes and love the result; it’s clean and un-cumbersome to the look of the door + display. You can buy similar wreaths to these here, here, and here (then add some of your favorite ribbon)! And…I’m sharing these little cuties for no other reason than I came across them in my search and LOVE them + the price! I hope you guys give the hidden hangers a try and dress up your doors!